You may feel you want to put it off but your garden workshop, shed or summer house does need treating from time to time to give it a long life. If you follow our advice you won’t need to do this more than every 2 or 3 years. This will ensure your garden shed and outbuildings can be protected against everything the weather can throw at it. Treating a garden shed can be a messy affair, certainly, if I am doing it, so the advice is to wear old clothes which can be thrown away if too badly stained. Always bear in mind that many treatments can irritate the skin due to the chemicals in them which help to preserve the wood. But always take your time and try not to splash the treatment. If you do get any treatment on your hands, face or skin ensure you wash this off straight away. If you have the opportunity try to treat your shed or summer house before it is assembled, certainly if it is one on the cheap sheds obtainable on the web or at your local DIY superstore as you will find the treatment they use is just like coloured water and does not give any protection to your shed. By doing this before assembly you can ensure that all parts of the shed is treated. Whilst, when assembled these parts won’t get any weather, it will not do any harm if you can do so. Always try to ensure your shed is liberally coated to stop moisture getting into the wood. You will find that PAR (prepared all round) timber such as shiplap or T&G sheds will have a smooth finish and you can paint the treatment on very easily. However, as the treatment will not soak in too well it is best to give your garden shed at least two coats. If your shed is a feather edge or made from sawn finished timber you will find the treatment will really soak into the timber and will take longer to do. However, you will know that this treatment will last the longest due to the treatment soaking into your shed timbers. You can choose to use a spray to apply treatment to your shed but, if you do, it is vital that you wear a face mask and, ideally, goggles to ensure that the fine spray does not get down your throat or on your eyes. It some instances where it is awkward to get to, such as between the fence and the shed a spray is a good idea. By getting on the shed roof you can reach down into the gap and liberally spray the treatment onto all exposed areas. 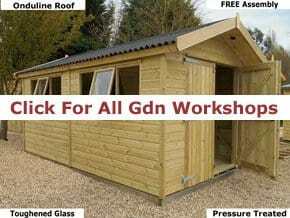 After you have treated your garden shed you can take a break from these duties for, normally at least 2 or 3 years. You will find that the sides of your shed facing into the weather, i.e. The sides which get the sun shining onto it or the rain splashing against it will need treating more often. It will become apparent by the shed walls fading in colour. Never wait until the shed shows signs of damp getting into the wood as this will be the beginning of the end for your garden shed. My advice is based on 39 years in the garden sheds business. For further advice about what type of treatment to use take a look at our other articles.